It’s time to get your skates on derby fans…Come for the action, the costumes, the hard hits! 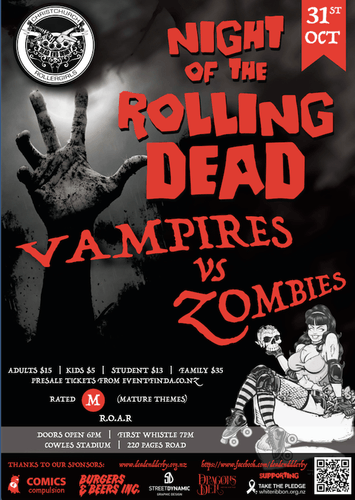 This Halloween the Dead End Derby Rollergirls will thrill you with all the live roller derby action as two equally matched teams present a real spine tingler and blood curdler! Vampire or Zombie? Which side do you choose? Get your creepiest costumes on and get ready to cheer on Team Vampire or Team Zombie. If you've never been to a Roller Derby bout before this is the game for you! Costumes, fast paced and fun action from the skaters, refs and the crowd. Doorsales are available and you can bring the whole family along with passes available for just $35 which will get 2 adults and up to 3 kids aged 5-12 in. Preschoolers are free, Adults just $15, Students (with valid ID) $13 and Children aged 5-15 just $5. Hot food available to purchase and a licensed bar on site with Delicious Derby specials. Rated M - Mature Themes. Parental guidance recommended. Come along and see for yourself! 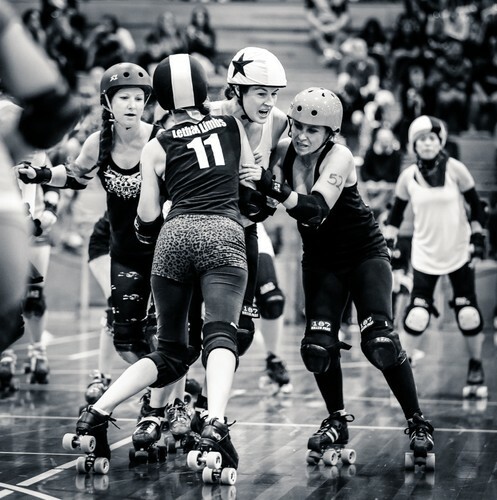 Get caught up in the action of live Roller Derby. Who knows you might even be tempted to join…. Doors open 6:00pm, first whistle is at 7:00pm. Tickets are available from the door – cash or eftpos. TIcket Prices: Adults: $15, Students $13, Children (5-12 years old) $5, Family Passes (2A up to 3C) $35, Under 5s free. Food vendors and licensed bar onsite. DED Merchandise available for purchase.